Speaking at the Park Slope intersection where Dorothy Bruns killed two small children in March, Mayor de Blasio announced the city will move forward with a redesign Ninth Street between Prospect Park West and Third Avenue starting in July. The redesign will include protected bike lanes and pedestrian islands. DOT expected to finish implementation by the end of the summer, said Transportation Commissioner Polly Trottenberg. Specifics of the design weren’t presented this morning (DOT is expected to go into more detail at a public meeting next month), but the basic template involves flipping the parking lanes and bike lanes, making crossing distances shorter for pedestrians and protecting cyclists from car traffic. Currently Ninth Street has buffered bike lanes that the city implemented about 10 years ago. They’re often blocked by double-parked cars, and there are no treatments at intersections to break up long pedestrian crossings and slow down turning drivers. This phase of the project will extend from Prospect Park to Third Avenue, where the dimensions of Ninth Street change, but redesigning the blocks west of Third Avenue is on DOT’s radar. “The street narrows after Third Avenue, so it does present some bigger challenges,” Trottenberg said. A future phase could extend to Smith Street. 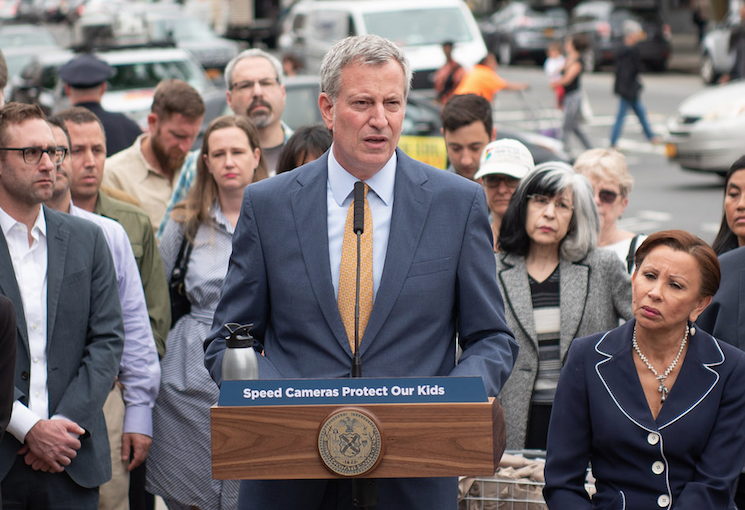 The mayor also used the occasion to call on Albany to renew and expand the city’s speed camera program, set to expire at the end of the year. DOT staff will be on hand at tonight’s street safety town hall hosted by Council Member Brad Lander at M.S. 51, but will only briefly address Ninth Street. The agency will present the complete redesign to the June 21 Community Board 6 transportation committee meeting. This seems so painfully obvious. Why do children need to die in order for this to happen?? It does not look like it will be a great design. Seems like they’re doing as much as they possibly can to avoid inconveniencing drivers while still allowing double parking. It’s too bad that they’ll spend so much money to cast part of this in concrete when it could be so much better. Suburban car oriented mindset from the powers that be. if we have protected 4th avenue lanes then we won’t need the 5th avenue sharrows. Cars and trucks already have 4th ave – we should make 5th ave a dedicated 24/7 bus and bikeway. -Split phase signalling for left turns, nobody should have a walk signal while cars are turning left at that intersection. 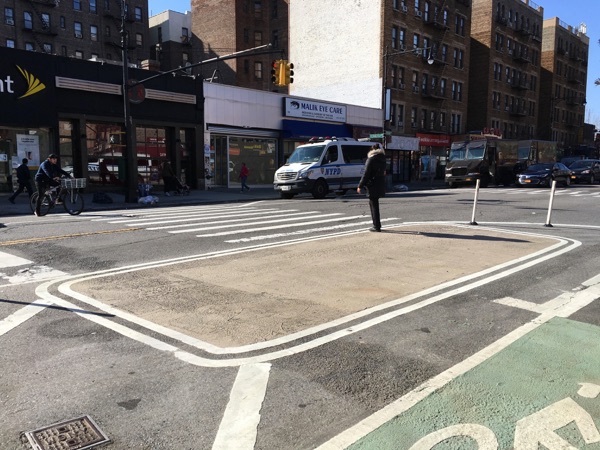 -MId-avenue crosswalks and stop lights should be installed on 9th street between 4th and 5th and 5th and 6th. A lot of people understandably cross the street mid-avenue there already, and an additional crosswalk and traffic light would also slow down traffic on 9th street. Hey! We know the justification for the traffic lanes and parking lanes, assuming that they are 10 and 7 feet, respectively. But the bike lane is, what, 4 ft, 5 ft.? Is this a major bike artery? How ’bout we start with space for a faster cyclist (electric) to pass two riding next to each other (social)? This is about 10 ft. Bus needs space too. So 2 x 11 + 2 x 10 = 42 ft. Plus two 2 ft. medians. 46 ft. The 11 ft. bike lane narrows to 4 ft. for bus platforms. There’s 10 ft. left, enough for one car in one direction, and a 1 ft. median between it and bike lane. Narrowing bike lane to 10 ft can make medians a bit larger. Obviously there is no space for parking. Buses will not pull over at stops. The graphic above is less useful than a napkin sketch. 4th Ave will definitely be the long-distance bike route of choice, but 5th Ave still needs to be safe and comfortable for all street users, given that cyclists will still be there for local trips and to access businesses and whatnot on 5th Ave.
yeah but it’s too narrow to do anything besides sharrows so I don’t know how physically you can do much about it besides having cops actually police the route. This is not, by an objective measure, a “narrow” street. We can do something about parked cars, which we don’t need to bend over to accommodate, on a corridor that has buses that run supposedly every 5-6 mins during the day time and a subway local line one avenue away. We need better loading zones and they should increase the f out of the metered parking rates. But the idea that we can only have sharrows here is laughable. 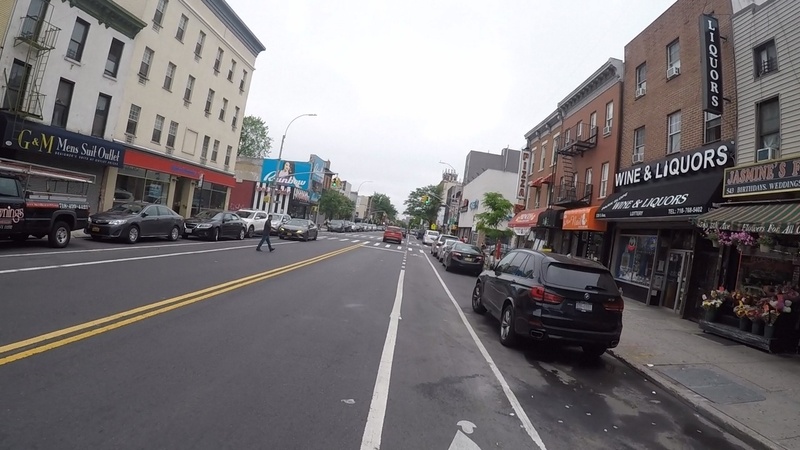 Here’s a section with sharrows — objectively speaking, this is not a narrow street. 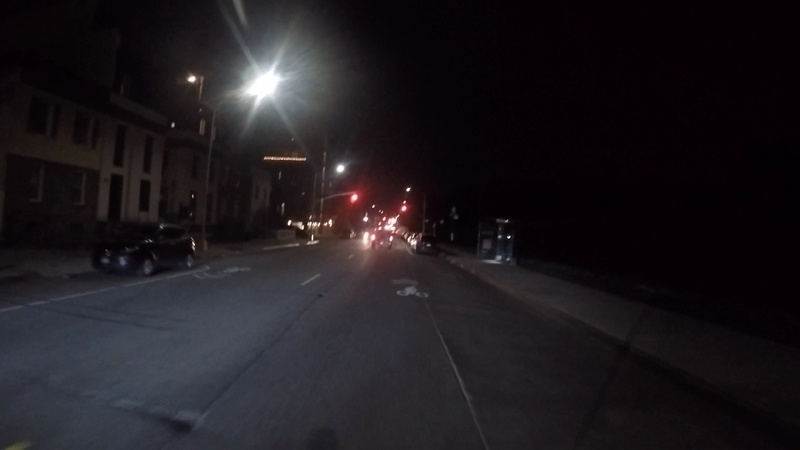 I’d love to see it narrower so that cars don’t feel the urge to pass me when we approach a red light at the bottom of a hill. this is only a small part of that fifth avenue stretch. I bike it every day and 60 percent of it is narrow. What we need and what we’ll get are two different things. In a real utopia we’d have automatic cars and deliverys only at night but that might be a few decades off. Any pdf of this project? I’d love to see the presentation from last night. Narrowing the median removes it as a refuge for pedestrians. Not happening. 4th ave project already started, slowed down because of MTA, but it will be much better than overloaded 5th. This project is quiet great but I hope you also consider the suggestions of other people. No project is perfect but if we are helping each other, it could be successful. There’s a lot of bikes like Morpheus, Trek and Giants need this protected bike lanes.